A concert by Rodrigo Villa, saxophone professor at the Higher Music and Dance Conservatory of the Balearic Islands, Spain, and the Psaiko Quartet, a saxophone quartet formed by his best students, will be held at the Science Faculty Auditorium of the University of Sri Jayewardenepura on Saturday, 17th November 2018, at 6 p.m. The concert is free of charge for the public and passes can be collected from the Vice Chancellor’s Office, USJP, from Tuesday 13th November, during working hours or seats reserved on the phone by calling 0727199204. The concert is sponsored by the University of Sri Jayewardenepura and the Institud’estudis, Balearics, Spain, and is organized by sitarist Pradeep Ratnayake, Professor of Music, Department of Languages, Cultural Studies and Performing Arts, Faculty of Humanities and Social Sciences, in keeping with his idea of making universities which teach music, centres of world-class performances and access points for the general public to listen to and appreciate music. Rodrigo Vila is a young performer with a short but intense professional career, who already excels in festivals such as the International Music Festival of the Mediterranean. He has also performed with the Orchestre National Bordeaux-Aquitaine, the Spanish National Orchestra, the Madrid Symphony Orchestra, the Balearic Islands’ Symphony Orchestra, the RTVE Symphony Orchestra, the Madrid Orchestra, the Plural Ensemble, and the ACA Ensemble, among others. He has recorded for the national broadcasting networks France Television and Radio TelevisiónEspañola, as well as the public radio stations CatalunyaRàdio, Radio Galega and IB3 Ràdio. He is currently finalizing the launch of this first solo album with the label Ona Digital. Throughout his academic career, his students have excelled, both individually and in different chamber groups, in the most renowned national and international music competitions. 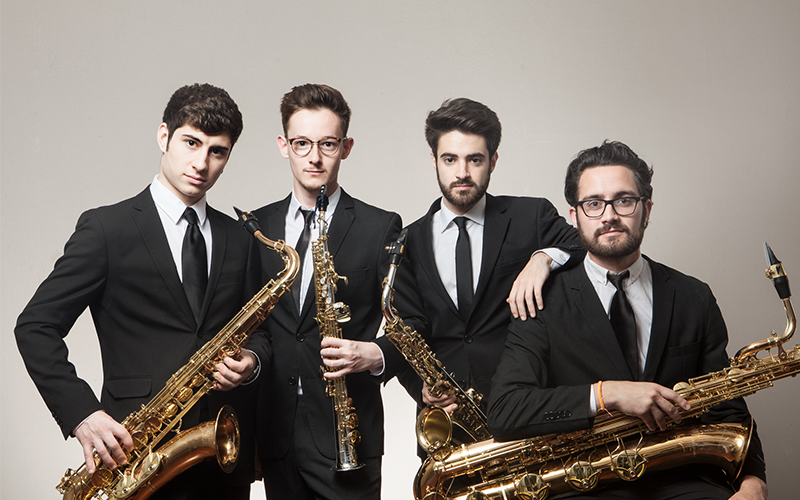 Coming from Argentina, Valencia, and Galicia, the four saxophonists of the Psaiko Quartet started their career as a chamber music group at the Conservatory of Music of the Balearic Islands in 2015, under the tutelage of Rodrigo Vila, Beatriz Tirado and JoaquínSáez.They have performed in many places and performed in many music festivals within this short time. In 2016 they won 2nd Prize in Chamber Music Competition “Musical Youth of Ávila”. In 2017 they got First Prize in 88th Permanent Competition “Juventudes Musicales de España” and also they took First Prize in “ArtJove” Chamber Music Competition. In 2018 win First Prize in “ Thailand International Wind Symphony Competition” Chamber Music Class. The concert will be a treat for music lovers.